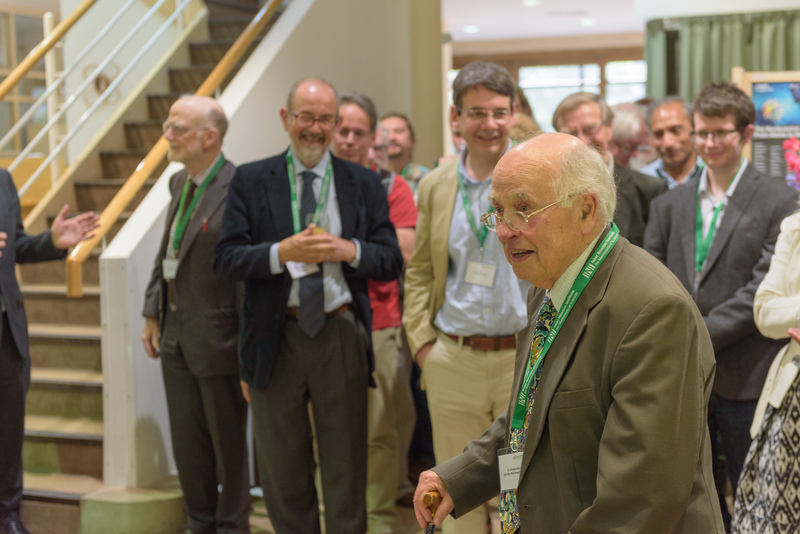 The Institute was deeply saddened to learn of the passing away on Friday 11 January of Sir Michael Atiyah, founding Director of the Institute. 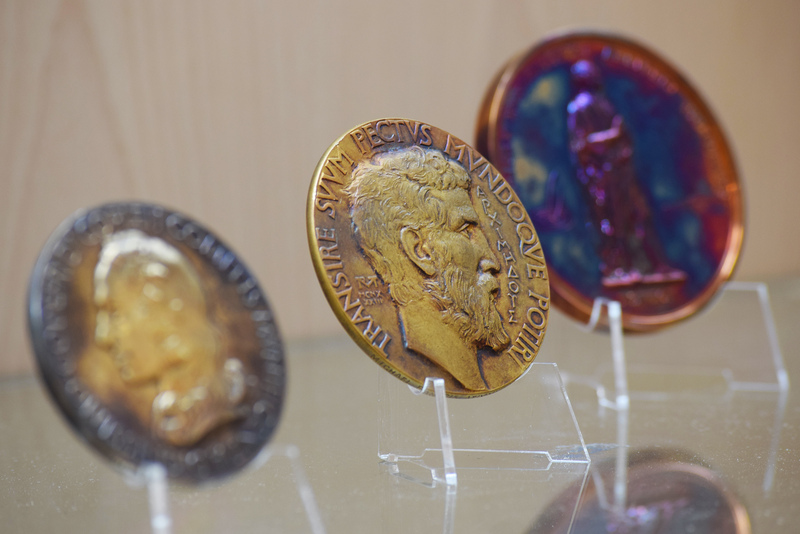 One of the greatest mathematicians of his generation, Sir Michael was awarded countless prizes and medals many of which we are proud to display in the Institute including, most notably, the Fields Medal which he was awarded in 1966. 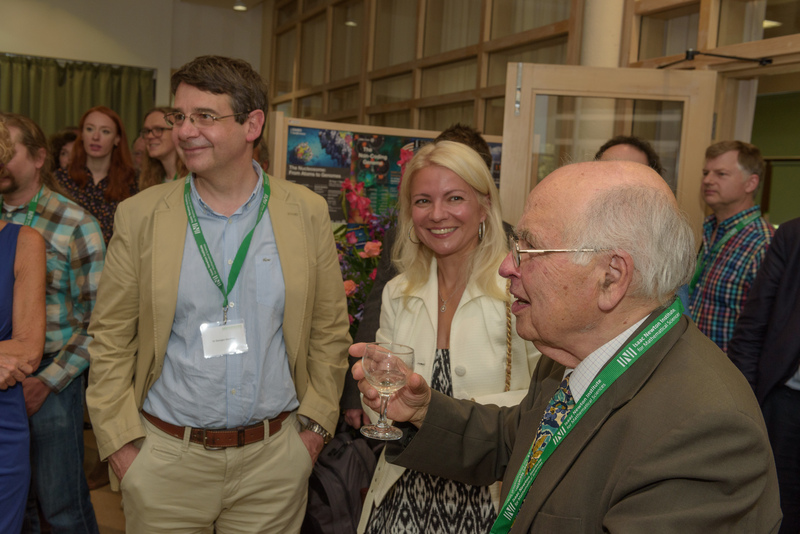 INI Director David Abrahams, said: "Michael Atiyah was a brilliant scientist and remarkable personality. I always felt that his brain was permanently in top gear - and in his heyday no-one could keep up with him. Even in his later years he still managed to captivate audiences and woo the media. In my early years I was scared stiff of him. In recent years he lectured me on how to do things 'properly' at the Institute, and he continued to send me ideas on innovating and improving the place. He was a towering figure of British mathematics and physics whose personality and influence had a major effect on the whole world community. The Institute will always be in debt to him - and he was very proud of the place". 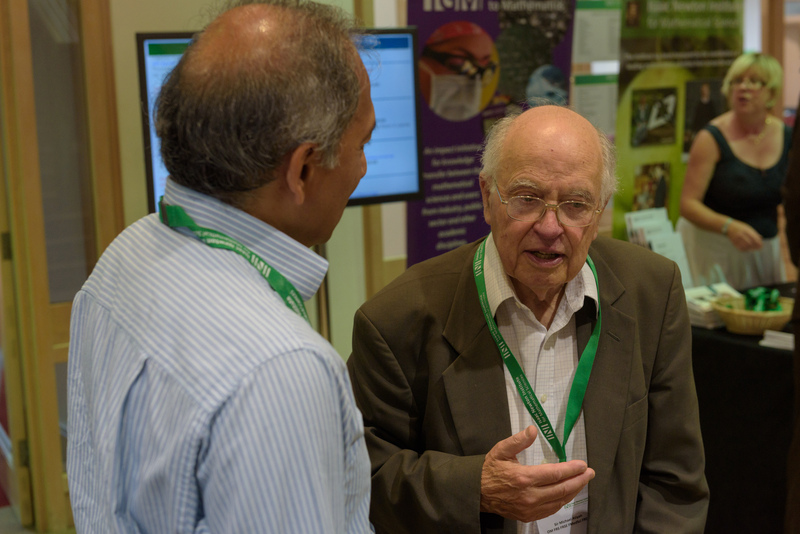 Amongst the outpouring of tributes to Sir Michael, perhaps one theme that resonates beyond all others was his passion for discourse and collaboration. Colleagues and peers have described him as a "a true internationalist and a fervent supporter for investing in talent" (Venki Ramakrishnan, President of the Royal Society), and it is oft repeated that many of the great mathematical leaps of the post-war 20th century era had been made by him and/or "whoever he was speaking to at the time". Beyond his 1966 Fields Medal, he was also the joint recipient of the 2004 Abel Prize. 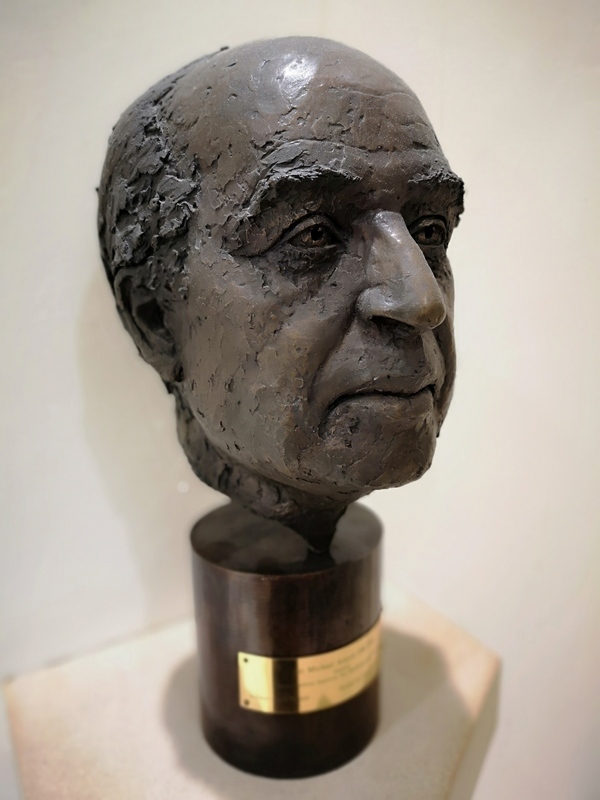 Both were awarded for his work with Isadore Singer on the differential equation-related index theorem - which Atiyah described personally as "a bit of black magic". 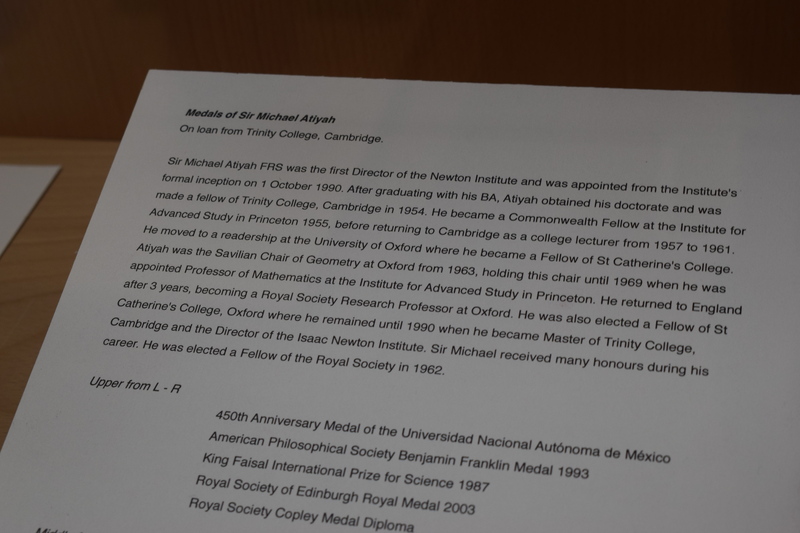 In their official statement on the award, the Abel Prize organisers said that: "Atiyah and Singer will receive the prize for their discovery and proof of the index theorem, bringing together topology, geometry and analysis, and their outstanding role in building new bridges between mathematics and theoretical physics", going on to add that: "the Atiyah-Singer index theorem is one of the great landmarks of twentieth century mathematics, influencing profoundly many of the most important later developments in topology, differential geometry and quantum field theory. 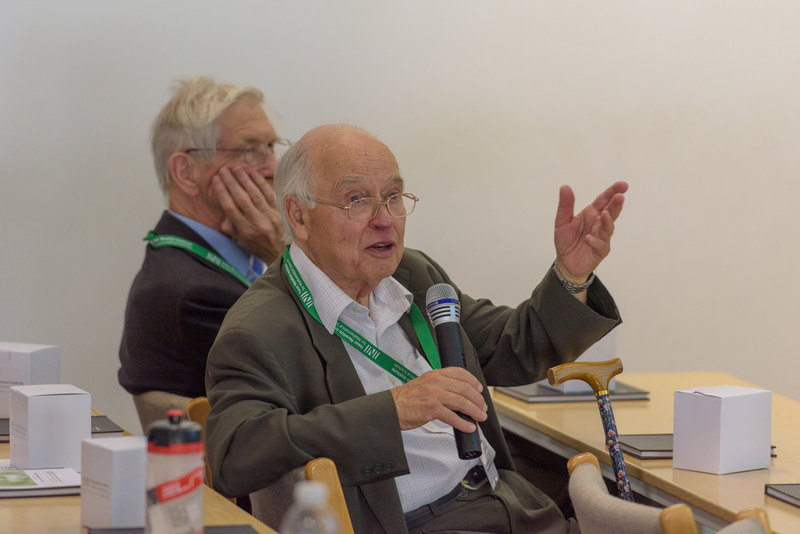 Its authors, both jointly and individually, have been instrumental in repairing a rift between the worlds of pure mathematics and theoretical particle physics, initiating a cross-fertilization which has been one of the most exciting developments of the last decades". 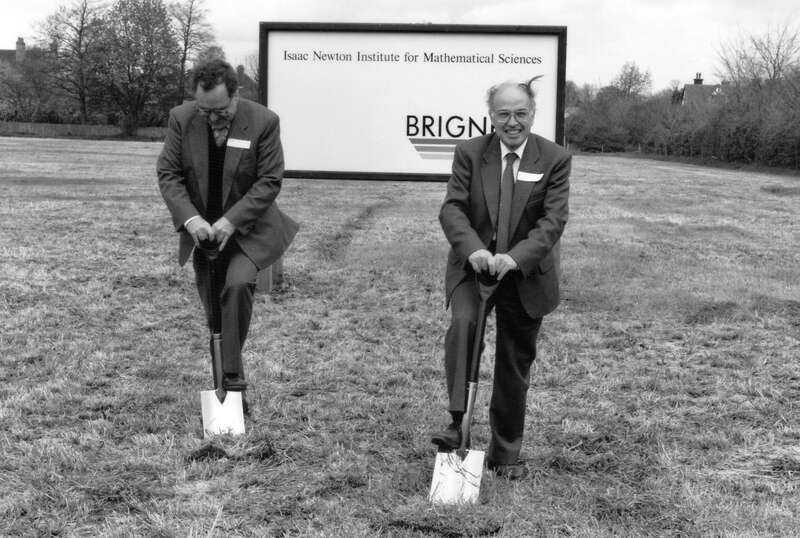 It is fitting that the nature of this theorem should relate to the unification of so many disparate fields and schools of mathematics: building bridges, forming connections and lighting sparks was Atiyah's personal forte. 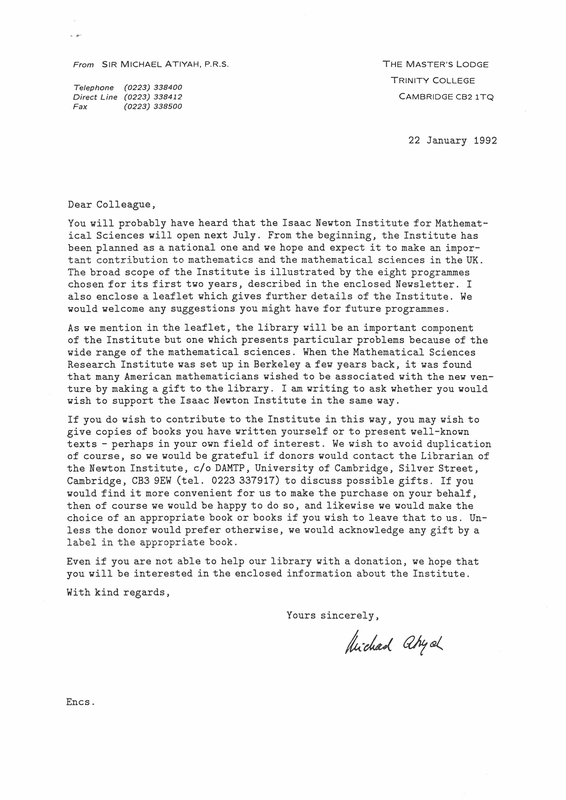 Atiyah's connection with the Institute was a deep one. 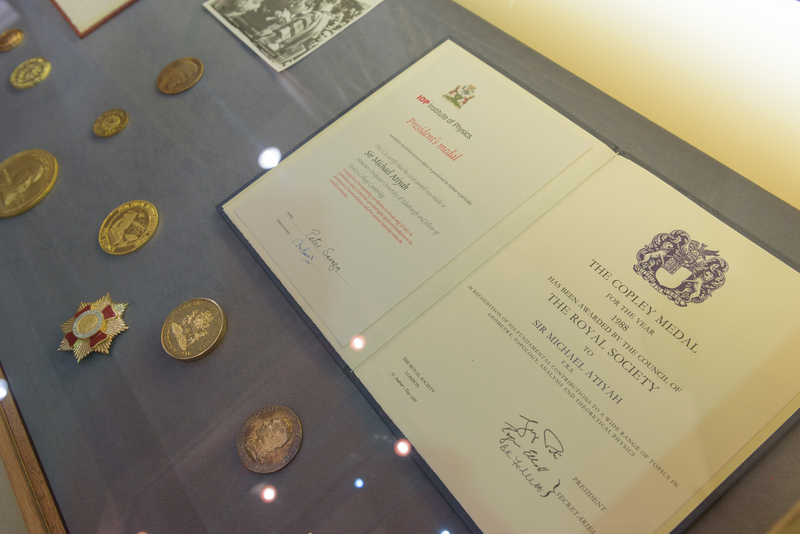 He was founding Director in 1990, during a time in which he was simultaneously Master of Trinity and President of the Royal Society, and (as David Abrahams' above words imply) was an active presence ever since. 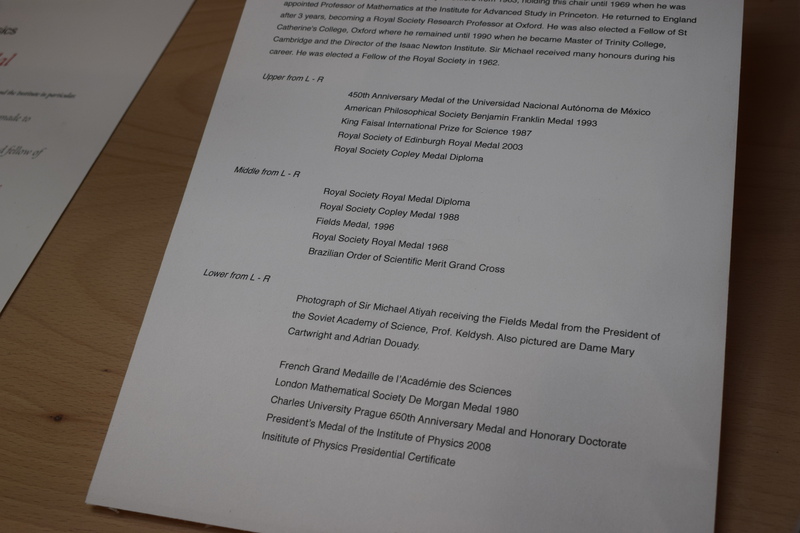 What is perhaps less well known is that "Isaac Newton Institute for Mathematical Sciences" was a title of his choosing. 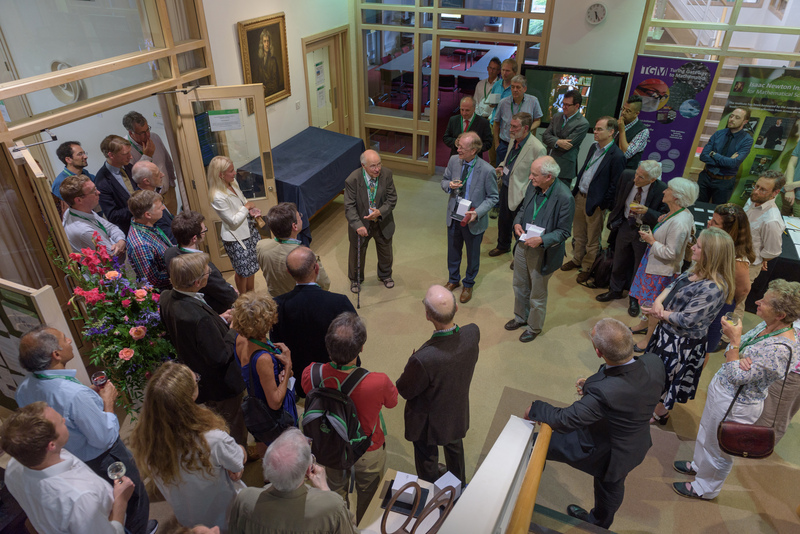 He remained an honoured guest at the Institute throughout the rest of his life, attending events here as recently as 2017 including INI's 25th anniversary celebrations (see gallery below) and also a workshop on symplectic geometry honouring his own former PhD student Sir Simon Donaldson. 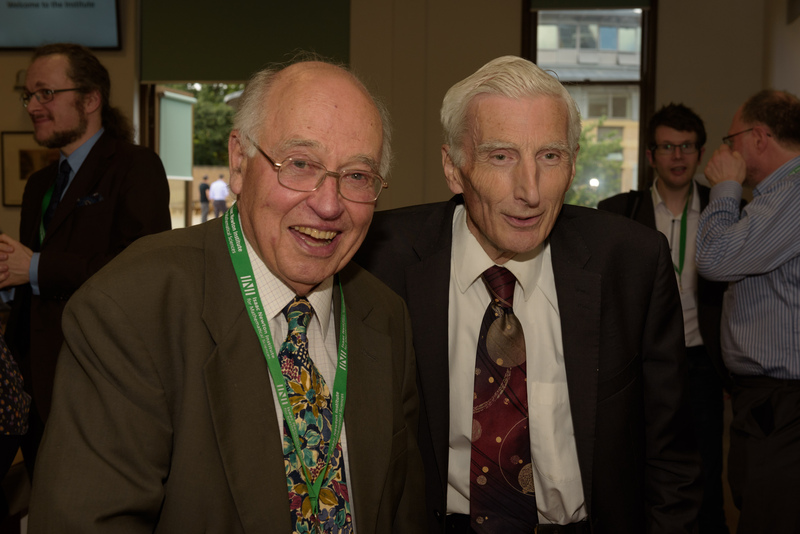 Astronomer Royal Lord Martin Rees said of Sir Michael's involvement here that:"(his) globally-acclaimed eminence, combined with his intellectual breadth and conviviality set the Institute on the course that has continued ever since". 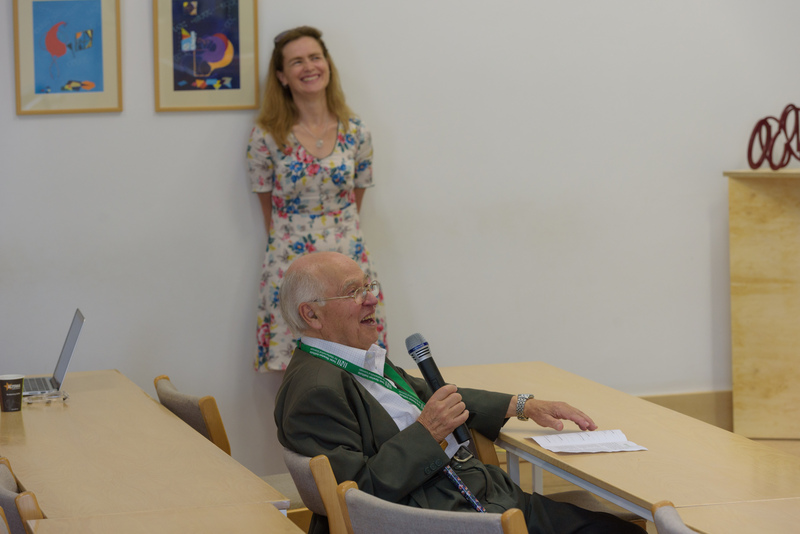 Sir Michael memorably described mathematics as "human curiosity in its purest form". The intellect and energy that he brought to this purest of sciences will be much missed. Our thoughts are with his family, friends and all those whose professional paths crossed that of this most eminent of men. 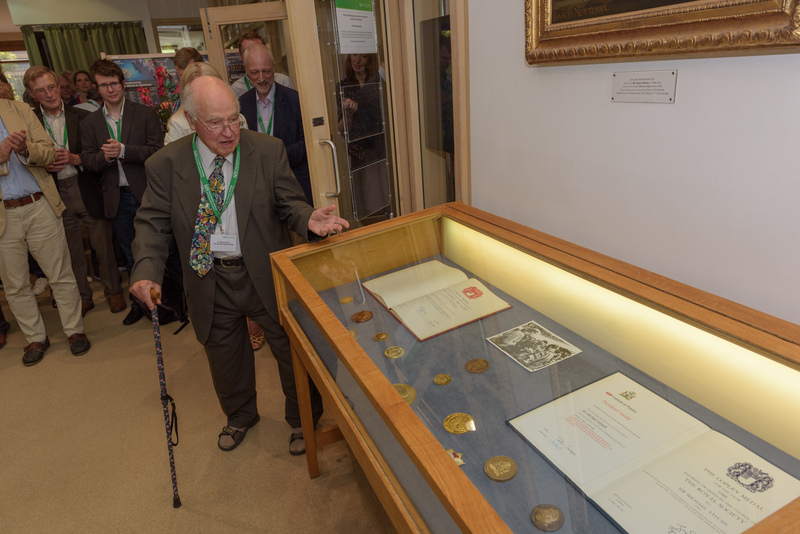 A gallery follows below featuring images of: Sir Michael breaking ground at the Institute's founding, INI's 25th anniversary celebrations in 2017, Atiyah's first open letter sent as Director of the Institute, Atiyah's bust and medal collection currently on display at INI.